An implied plot that doesn’t seem to go anywhere. Frame-rate drops that kill in later levels. Endless mode starts off slow. 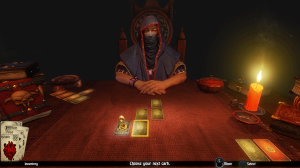 Defiant Development’s, “Hand of Fate” is a pretty solid game, but it’s definitely not for players who don’t know how to exercise a little patience. This game will test you, and you will fail, but every once in a while, you’ll come out on top, satisfied at whatever momentary victory you’ve earned. In a cabin near the end of the world, past the thirteen gates, you take a seat at a table. Here, you encounter The Dealer, an enigma who seems to know more about you than you know yourself. He deals the cards and suddenly, they spring to life. You’re drawn into a game of life or death, and the only way to win is to keep playing. 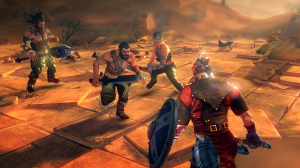 Defiant Development’s, “Hand of Fate” is a game that blends elements of the table top genre with rogue-like mechanics, and text based storytelling into an action-rpg where players can shape their own adventure. The cards are placed on the table face down, and form a floor (map); then a golden game piece is placed on the map which represents that player’s character. The player’s objective is to make navigate their way through each floor, uncovering cards until they reach the boss of each dungeon. The Dealer’s deck is separated into two different types of cards: Pain and Gain. Pain cards have varying effects, such a decreasing your maximum health, or causing you told lose food (which is essential to your survival.) Drawing too many of these to early can mean ending a run fairly quick, or making a longer run even more difficult. Gain cards are the complete opposite of Pain cards, and can (rarely in my case) counteract just about any negative effects of Pain cards you’ve drawn. Drawing one of these cards can mean acquiring a nice piece of equipment from your deck, such as a mace that can call down lighting to damage, as well as stun your enemies, or a helmet that can reveal the pathway to the next floor of the dungeon. The cards can also supply you with food, and gold, which you can use to buy all sorts of things from travelling merchants and priests. For players who don’t have much experience with table-top games or rogue-likes it can said that the game can be slightly confusing starting off, you aren’t informed on what kinds of cards do what, or how they work. So prior knowledge of this type of game is definitely a plus, but after a while, anyone can pick up how it works. As players make their way through the floors of the dungeon, they’ll find encounter cards. These cards are cards that thrust players into a situations that can either help them, or hamper their progress. You’ll definitely see some peculiar situations because of these; some will land you in a bar fight over a measly twenty gold, some, sneaking star-crossed lovers from home so that their love can bloom, and others will have you gambling for your soul against Davy Jones himself. Most of the encounters you’ll face begin with a token attached to them. This means that by fulfilling certain conditions during the encounter, such as picking the correct card from a Success/ Fail pool, or making a the correct choice when presented with one, you’ll be awarded the token. You want tokens; these are what you use to unlock new cards, and without them, you won’t be able to unlock new items and encounters. Sometimes, what seems like it might be the best choice isn’t what you need for a token. In one particular encounter, I went to sleep in an inn, only to wake and find a bandit going through my belongings. After a bit of a struggle, and eventually killing him, I didn’t get anything special; in fact, I missed out on the token that was attached the card, and ended up having to replay the entire encounter in another run. Certain encounters will throw you into battle. Here, cards are drawn, different suites and numbers mean different enemies of different quantities in each battle, as well as different types. This means that in most cases, each battle will be different, with different challenges. The fighting system of the game is very similar to that of the Arkham (Batman) series; the player fights quickly, with streamlined attacks, and is give a prompt when enemies are about to attack. These prompts are colored so that players know when attacks can be counterattacked (green) or if they’re unstoppable attacks (red). It must be noted that players can only counterattack when they have a shield, and if they don’t, they’ve got to make sure to move quickly out of the way of any attacks. All in all though, the fighting system is pretty simple. 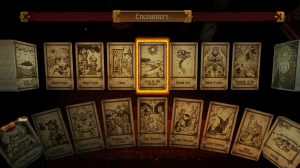 After a few runs through the dungeons, you’re able to select Endless Mode, a mode where all of your cards are put into the deck, and you play to see how long you can last. In this mode, regardless of what your deck set-up for story mode is, there’s a chance that you’ll run into things you didn’t expect. While this is most definitely a welcome change in a mode where everything is left to chance, I have to say that it was annoying at some points. By the time you’ve unlocked Endless Mode, this game seems like it’ll be pretty easy, and that’s true, for the first few runs. Each run happens on a tier, and the end of each, players battle for The Dealer’s objects of power. 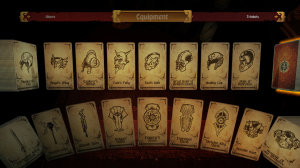 Obtaining one of these items means an upgrade for the players characters, such as better starting equipment, or gaining a blessing at the beginning of each run; this also means an upgrade for the enemies players must face, such as skeletons gaining the ability to be resurrected after a certain amount of time, or Lizardmen gaining the ability to shield themselves with flames. On top of the upgrade that enemies get, the Pain Cards and dangerous encounters put into The Dealer’s become much more dangers. On the bright side, the upgrades acquired from objects of power carry over into Endless Mode. I have to say that endless mode starts off a bit slowly (most of the gains you get are minimal at best). It feels almost like you’re starting the entire game over, making it hard to keep up the excitement and tension that you feel during (later) a story mode runs. This being said, endless mode’s difficulty increases with each floor, meaning that you’ll see more traps, Gain, and Pain cards all around, and things can eventually get infuriatingly difficult. You never know what you’ll see here, since you’re unable to decide which cards are put into the deck, and this means that no endless mode run will be the same as the last. This definitely adds some great replay value. Admittedly, I haven’t personally been able to beat the story. Some parts of the game seem downright impossible unless you’re lucky enough to draw the right cards early on, and enough failure choices will end your run quick (at one point I had my soul stolen, resulting in instant death from full health.) On top of that, after finally reaching the final boss, I encountered a glitch which trapped me behind a barrier that I couldn’t attack through. This leads to another big issue I have with this game; frame-rate drops. These seem happen regularly when the dealer is manipulating the cards, and while it isn’t an issue then, I’ve also had to deal with it during battle, especially latter on in the game. Having low health, and fighting through a crowd of enemies whose attacks you couldn’t even see coming is a big issue for me, especially after having made it a long way through a run; I felt absolutely cheated. Frame-rate drops, and ridiculous difficulty aside, I have to say that Defiant Development’s, “Hand of Fate” is a pretty solid game, but it’s definitely not for players who don’t know how to exercise a little patience. This game will test you, and you will fail, but every once in a while, you’ll come out on top, satisfied at whatever momentary victory you’ve earned. In the end, I give Defiant Development’s, “Hand of Fate” a 7.0 out of 10.